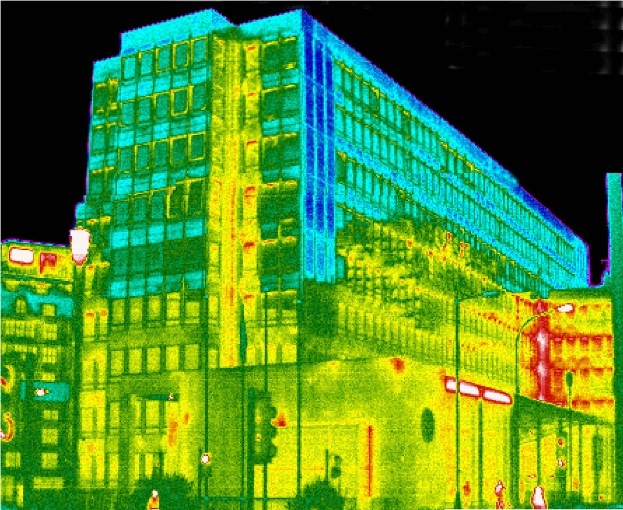 Thanks to the loan of a thermal imaging camera from FLIR Systems, Thermalcities has a large pool of decent original thermal images of to present. Thanks also to people associated with: Canary Wharf; Centre Point; London Zoo and Tower Hamlets Town Hall for allowing access to take the pictures. Finally, special thanks are due to The British National Space Centre; Horton Levi Ltd; Hot Mapping Limited and an increasing number of other contributors who have kindly allowed their work to be reproduced on this site, as cited on the relevant pages. London's Tower Bridge and City Hall, as captured by a thermal imaging camera on a cold, sunny winter day. The Sun's heat is reflected and radiated by the buildings, whilst the cloudless sky is a cold, dark blue. This picture, purely of detected heat, comprises several thermal images, knitted together, to provide a broad field of view. 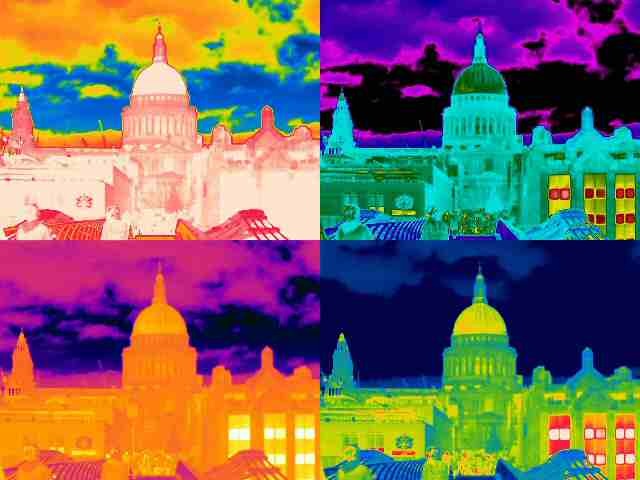 To the right is a single thermal image of St. Paul's Cathedral, reinterpreted in four different heat-colour spectrums, each of which reveals something slightly different about the heat that can be discerned. This kind of exploration, with buildings, machines, people and images is explored much further throughout the site. Below is a small sample of the basic 'artistic' and 'curio' thermal images captured during the several days that FLIR Systems were kind enough to lend a camera for. Another composite of the Millennium Wheel; Thames and Parliament . This was taken on 27 December looking west, using a temperature spectrum that captured the buildings' silhouettes against the fractal patterns of the clouds. Copyright 2008. All rights reserved. Copyright for all images and text resides with Steve Lowe/ Thermalcities, except where otherwise stated.